RANCHO CORDOVA, CA OCTOBER 20, 2010: The Nor-Cal Rock Race on Saturday October 16th was entertaining for the spectators, and a lot of fun for the competitors with hundreds of dollars in prizes to win, and a $2,000 cash pro purse. “We had so much fun, it was the best $200 entry fee I have spent!” Randy Avery, who raced a red jeep on 35” tires, took the win for the Metal Cloak team and left with $1600 of cash in his pocket. Even though the list of drivers was short, the action that they brought to the course was crowd pleasing. “From the middle of the track you could heard the crowd laughing, cheering, and ohhing,” said John Goodby, Event Producer. 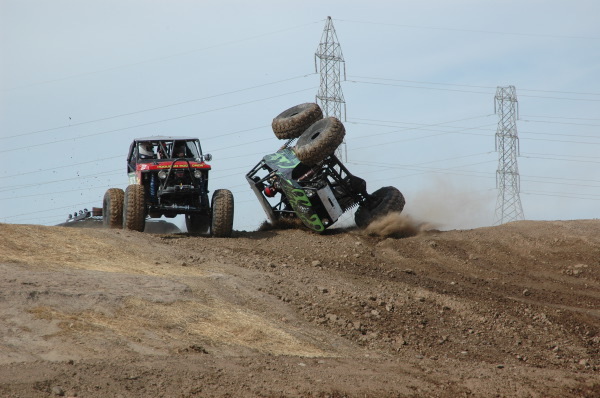 “Especially when they starting racing side by side and literally went wheel to wheel.” NorCal Rock Racing is short course racing with large rock piles, dirt obstacles and lots of turns that make it a perfect match for the Ultra4 cars all the way to Sportsman Class trail rock crawlers that want to prove they can go fast through the rocks too. Starting with nine rigs and ending up with 3 running at the end was a testament to how much fun these guys had. The 2 lap race bracket system was arranged by qualifying order. Kevin Yoder and Jeff Hollifelder started the battles with a close race giving Yoder the win, but eventually Hollifelder would be in the finals. Mike Smith and Jeremy Hengl started the second heat and Hengl took the win when Smith rolled his rig. Ian Jorgensen beat Randy Avery in the third heat when Avery’s 35” tires got stuck in a void in the rocks. In the second round of racing, Yoder DNF’d with front and rear differentials blown, Hengl blew a tire just before his rig caught fire. The third round was an exhibition that went wrong when Jorgensen’s Nor Cal Rock Racing rig broke a link bolt and put a hole in the oil pan. The final round of the day was very exciting between Randy Avery in the Metal Cloak Flat Fender and Jeff Hollifelder in the Trent-Fab Rock Buggy, but it was Avery who went across the finish line first. There were only two rigs that made the starting gates in the Sportsman class after Scott Muchow rolled his rig in practice. Chris Garrison beat Chris Elrod for a whole handful of awesome prizes including gift certificates from Raceline Wheels, PRP Seats, 4-Wheel Parts, Ruff Stuff, Rubicon Express, Performance Cryogenics, Marco Muffler, Infinit Graphics and a No Limit Fab Differential Cover. After the race, there was a fundraiser party benefitting the Rubicon Trail Foundation at Lake Bowl Bar and Casino. 100% of the door fee and a portion of the drink sales went to keeping the Rubicon Trail open and maintained.